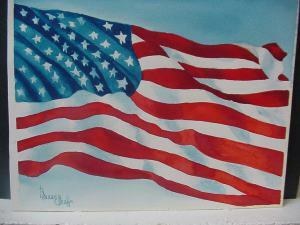 My watercolor painting, Old Glory. On the anniversary of September 11, 2001 I can’t help but reflect on the events of that day. Everyone can tell you exactly where they were when they heard the United States was under attack. We were in shock and disbelief that the United States could be attacked on our soil! As an individual I was shaken to the core, how could this happen in the United States? All security as I knew it was gone. The sound of a plane in the air will never go unnoticed again. I still get nervous if I see a large plane flying too low. I was deeply moved by the many photographs from the attack sites. The raw emotion of the firemen and rescue workers was obvious. Most Americans were left feeling helpless and shaken. As an artist I felt the need to work through my grief and emotions by creating a painting. One photograph emerged as best expressing the despair and helplessness we all felt, the cover of the Star magazine depicting a single fireman. I felt compelled to paint it, never realizing how that simple act would lead me to meeting the man captured in the photo. Creating this painting was very therapeutic for me. As I worked my mother watched the painting develop. The more work I did the more convinced she became that I needed to find this fireman and give him this painting. My mother tends to always be a dreamer…how in the world could I ever find this fireman, it would be like finding a needle in a haystack in New York City. Upon completing the painting I called one of my dearest friends, Tandy, to tell her about the painting I had just completed. 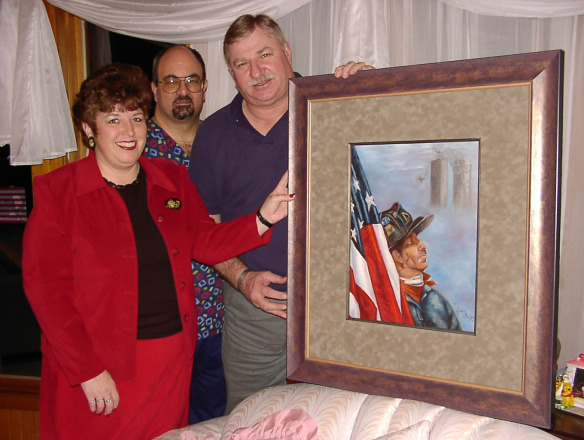 She had always been very active in the local volunteer fire departments and ambulance squads so I knew she would be very interested in hearing about the painting I did in honor of 9/11. Several weeks later I received a phone call from Dr. Larry Rogina, a physician I had worked with at Waynesboro Hospital. He had always been a supporter of my art work. I thought it was very odd that he was calling me until he quickly revealed the purpose of his call. 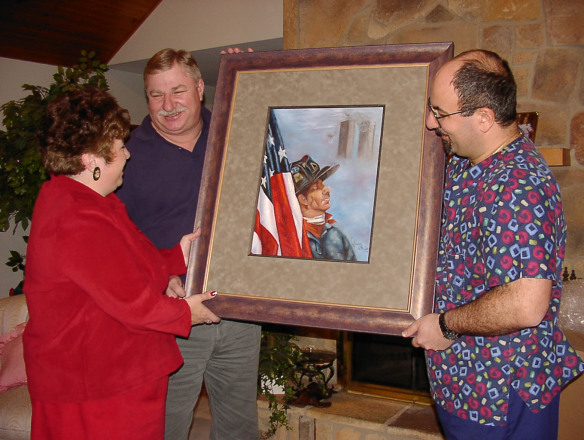 Tandy had told him I painted a fireman from the 9/11 scene in NYC. He quickly asked what photograph I worked from, and he was in disbelief as I told him the cover of the Star magazine. He proceeded to tell me the fireman was one of his best friends and his name was Rick Doran. Eleven years later as I tell this story I still get goose bumps all over me! Dr. Rogina came to my house to see the painting. He took photographs to send to Rick. Honestly in my wildest dreams I never thought I’d know who the fireman was, let alone know one of his friends. I do not believe in coincidences, I believe God has all these things planned in our lives. 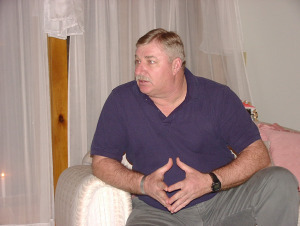 In February of 2002 Rick and Gail Doran visited Dr. and Mrs. Rogina in Waynesboro, PA. I was invited to come and meet them. It was a wonderful opportunity to visit with them and thank him for all he did on 9/11. 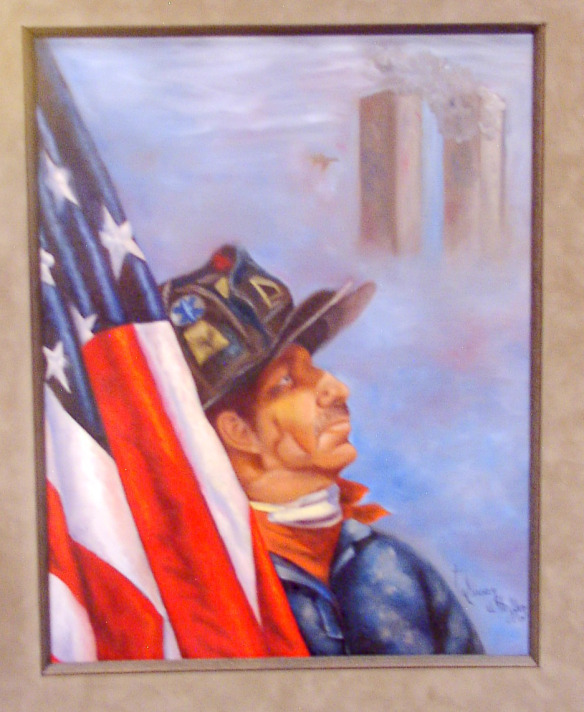 I presented him with the painting, he took it to New York City Fire Department Headquarters where is still hangs today. The circle was completed when I met Rick and gave him the painting. I used digital images of the original painting to create a computer graphics collage of 9/11. 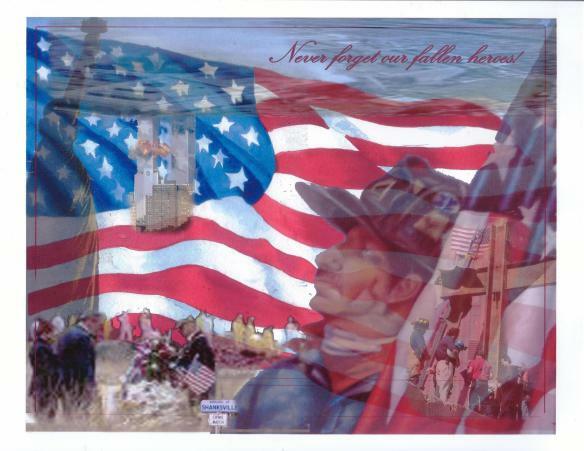 The backdrop of the American flag is also one of my paintings. Art gives me never ending joy! I’ve had wonderful experiences in my life because I have art in my life. I feel such gratitude to God for giving me the opportunity to explore and develop talent as an artist. I thank you for reading my blog. I’m glad to know my story touched you in a positive way. Thank you for shareing your wonderful story and pictures. The day has been a long one filled with memories. thanks for reading my blog….it truly was an unbelievable story and it happened to me! Have fun this weekend at the seminar…wish I could come! 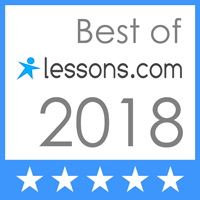 Susan,thanks so much for reading and the affirmations! Susan, I knew of your great talents but this is utterly amazing. Congrats to you for being able to give painting to the person shown. U R one unique lady!